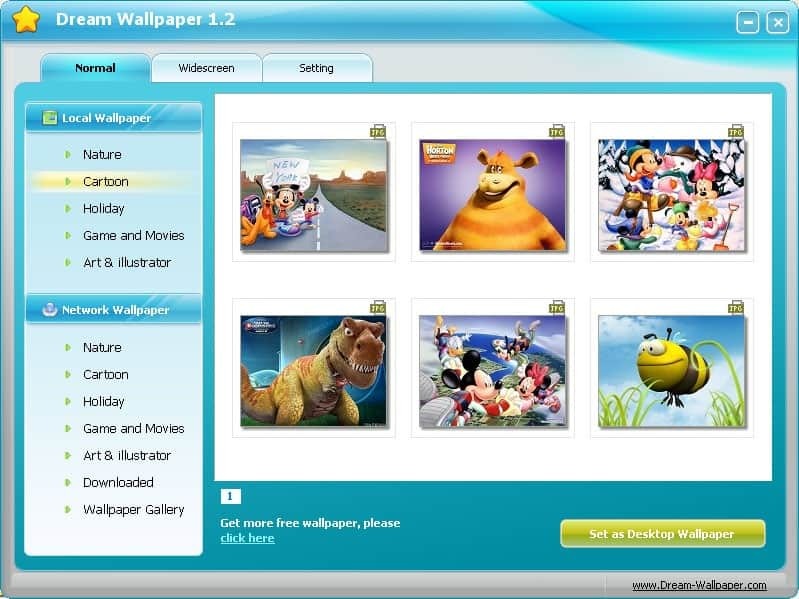 The Internet is full of websites where users can download wallpapers for their computer systems. The wallpapers are usually provided in several monitor resolutions, and can often be downloaded without registration or paying a fee. Several wallpaper websites have begun to create software programs to make it comfortable for users to grab wallpapers from these websites. Dream Wallpaper is a Windows Wallpapers application which provides access to wallpapers in several categories including nature, games & movies and cartoon. It ships with a few wallpapers that are installed with the application itself and provides an easy to use interface to browse local but also network wallpapers. Network Wallpapers referring obviously to the wallpapers on their website which according to them contains more than 80K wallpapers. Dream Wallpaper uses two tabs to distinguish between widescreen and normal wallpapers. Each tab contains a column on the left hand that links to local and network wallpapers in various categories. The local wallpapers are accessible right away, a click on a network wallpaper category loads a preview of six wallpapers from the Dream Wallpaper website. The maximum that can be pulled this way is 54 wallpapers in each category which seems a bit unfortunate but is probably part of the greater plan to bring more traffic to their website. The Windows wallpapers application has a quirk besides that. There is no information about the supported resolution next to the wallpapers which means that it is possible to end up with a wallpaper that gets stretched or otherwise mangled on the computer desktop. There is also no direct way to include already stored wallpapers in the application. The only possible solution would be to move the wallpapers into the program folder. This requires however the creation of a thumbnail for the same wallpaper. A far better solution would be to pick the wallpapers that you like from the application and copy them to your local wallpaper folder. The website is clearly structured and good to navigate. It does contain advertisement but not enough to avoid it. It uses a better structure as well, wallpapers can be sorted by screen resolution or theme. The good thing about this is that Linux and Macintosh users can simply visit the website and download the wallpapers they want which Windows users obviously could as well. The application would make more sense if it would provide additional options and some comfort in adding local wallpapers that have existed on the system prior to installing the software. I already have soooo many wallpapers, but this soft review gave me the opportunity to discover the website ‘Dream Wallpaper’, nicely organized and, for once, displaying original wallpapers when so many wallpaper websites share common pictures. ‘Dream Wallpaper’ seems to be a very nice place, I’m still discovering it at this time. It should be noted that the KDE desktop comes with online wallpaper integration. Although they are provided by KDE, the wallpapers will of course work on any modern OS. The reverse is also true: so-called “windows wallpapers” work just fine on Mac and Linux systems. Dotan yes I know, wallpapers are universal but I sometimes have to create titles for SEO reasons. wallpapers for people with nothing to do on their work time. working people who busy have no time to see desktop. 2 or 3 application open at office to do work. I used to visit this site. Nice to see they’ve come up with their own app. And it sounds less annoying than Webshots.